When I travelled to Sydney in February 2008 as International Judge at the Sydney Royal Wine Show, I was delighted to renew my aquaintance with fellow judge and winemaker Kate Goodman, whom I’d judged with previously at the McLaren Vale show in 2007. Kate is in charge of wine making at Yarra Hills winery, not far from Melbourne in Australia’s Victoria region. So when I later travelled on to Yarra, a visit to Yarra Hills’ Punt Road winery was in order. 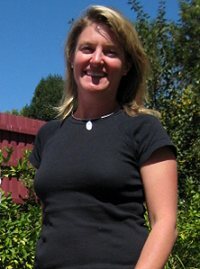 Kate has been here since 2001, having previously worked for various wineries around Australia, and in Champagne and California. She has also recently worked a vintage with ace Spanish winemaker Telmo Rodriguez. Kate’s personal favourite wine is Pinot Noir, and her refined style extends to the other varieties, white and red, within the Punt Road portfolio, as well as other wines she makes for Yarra Hills’ contract winemaking operation. See wine-searcher for stockists of Punt Road wines. Fruit fro Grifith. Gorgeous pineapple chunk nose. Fine luscious honey and really fruit flavours. Liquidised apricot with delightful orangy acidity and zest. Fantastic. Stuff. 90/100. $32. Very fragrant, with beautiful floral and cedary notes and plenty of exotic spice and smoky notes coming through. Moderate to pale colour. A certain earthiness too. Really nice fruit and lovely savoury length. 89/100. £10.99, Majestic. Vineyard selection, less than 200 cases. Refined blueberry fruit, with a certain density and concentration without extraction. Pure touch of vanillin, and a lovely fruit density. Fine cherry fruit and really nice. 91/100.